A while back the SA profiled Tadashi Ehara’s “Gamer’s Guide to Fedual Japan: Daimyo of 1867”. The book profiled all of the families that held daimyo status when the Tokugawa Bakufu returned power to the Imperial Family in 1867. While intended to serve as a guide for gamers, authors, screenwriters, and artists it also proved to be a valuable reference for historical purposes. It was intended as the first of a two part effort, the second of which has just been published. “Gamer’s Guide to Feudal Japan: Shogun & Daimyo-Military Dictators of Samurai Japan” proves to be a worthy follow-up to its predecessor. As author Ehara implies in the press release, the two books could in effect be called “Winners and Losers of the Samurai Era”. This would in effect be the “Losers” volume, covering the multitude of clans that died out, were dispossessed, destroyed in battle, or otherwise lost their holdings from the late Heian era to the end of the Tokugawa Shogunate. While the daimyo discussed can be termed ‘losers’ they’re some of the most famous families in Japanese history-the Taira, Minamoto, Toyotomi, Takeda, Otomo, Asai, Imagawa, Ashikaga, Kamakura Hojo, and Chiba being just a few. And while these clans might be termed losers, “Shogun & Daimyo” proves to be a winner. Author Tadashi Ehara has a long history in the gaming industry, having been involved with Chaosium Publications and their primary line “The Call of Cthulhu” as well as being the publisher of “Different Worlds” magazine. Being born in Sapporo, Japan, Tadashi developed an interest in the history of his homeland that came to the forefront when he was gifted with a copy of E. Papinot’s classic “Historical and Geographical Dictionary of Japan” in the 1980’s. It formed the basis for “Daimyo of 1867”, and while still an inspiration for “Shogun & Daimyo”, Tadashi told the SA that he incorporated much more from other sources for the new book. Ehara is frank in his admission that “this is not a scholarly piece of work”. Despite this, Shogun & Daimyo’s main sources are for the most part pretty impressive and standard college level texts. Some of them include William Deal’s “Handbook to Life in Medieval and Early Modern Japan”, Papinot’s “Historical and Geographical Dictionary of Japan”, Edwin Reischauer’s “Japan: The Story of a Nation”, Kenneth Grossberg’s “Japan’s Renaissance”, John Whitney Hall’s “Japan Before Tokugawa”, and other works by Paul Varley, Hiroaki Sato, and Conrad Totman among others. The Samurai Archives is also listed as a source (so it MUST be accurate, eh?). The book is generally laid out three columns to the page and contains hundreds of illustrations, photos, prints, family trees, and crests. It’s a nice looking trade paperback and weighs in at over 335 pages. While it might not be suitable for, say, writing a college dissertation on “Rice Weighing Methods of the Merchants of Sakai During the 11th Month of Bunroku 2” or even “Why Kiyomori Wasn’ t A Daimyo Even Though The Heike Monogatari Calls Him One” ;), you won’t find a better sourcebook for gamers (whether of the RPG variety or historical variety), authors, or amateur historians. The book’s first section gives some background information such as how to pronounce Japanese kana and also details how certain things will be represented in the book-for example, the Japanese calendar and the order of Japanese names. It’s followed up by a timeline extending over several pages that gives a short history of the different eras from about 35000 BC to 1868. After that is an examination of the governmental systems employed by the Imperial Court, the Kamakura Shogunate, the Muromachi Shogunate, and the Tokugawa Shogunate. The organizational charts and explanations of offices for each will make this section alone a great reason to pick up the book. If you’ve ever wondered how the sometimes bewildering mishmash of offices, titles, and positions relate to each other, this will lay it all out in black and white. After that comes biographies of the different men who held the office of “Shogun” under the Minamoto, Ashikaga, and Tokugawa. There are also bios given for the Hojo Shikken (regents) who took over from the Minamoto, along with the puppet Shoguns from the Fujiwara and Imperial Family (yes, strange as it seems, Imperial Princes actually served as Shogun at one point). 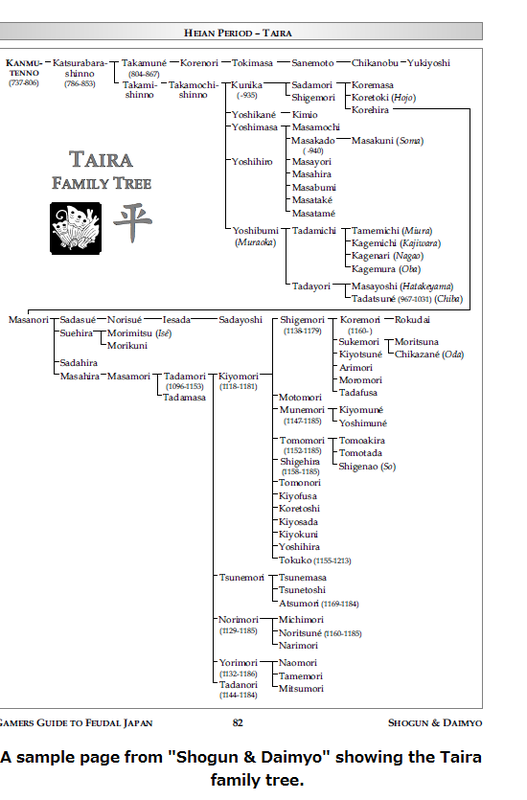 Family trees for the Hojo, Ashikaga, and Tokuagawa are included. Going through this section will give the reader an excellent overview of the flow of Japanese history during the majority of the samurai era. Following that is the real meat and potatoes of the book-a listing of over 170 daimyo clans with the clan mon, biographies of well-known family members, descriptions of their holdings, and the occasional family tree. It’s lavishly illustrated and a gold mine of information on the more notable figures of the samurai era. The entries are broken up into eras with each of the clans being listed in the era it ceased to be a player. While this is a bit confusing at first, it’s rescued by an excellent dual purpose index sorted into clans and individuals. The index also lists (in italics) all of the corresponding entries in the earlier volume “Daimyo of 1867”, so you can quickly find virtually any samurai of import with little trouble. Some of the entries further split clans into different branches-for example, the Saga-Genji, Daigo-Genji, Murakami-Genji, Uda-Genji, and Seiwa-Genji branches of the Minamoto. Some of the biographies are quite extensive, running a page or more. As with “Daimyo of 1867”, there will be many names familiar to readers but a lot of surprises as well. These entries take up roughly 200 pages on their own. Next is a short section specifically aimed at gamers. There’s a listing of over 100 chanbara films with short recaps of each, along with how to incorporate the character types into game campaigns. It’s followed by a kanji primer where the more common kanji are laid out for use in a game setting. Suggestions for campaigns follows this, and after that another great historical resource-a gazetteer of the major roads of Japan during the Edo period. It covers the “Gokaido” (the five major roads of Japan) and supplies maps, entries for the various way stations along with ‘tourist attractions’ for each, and a general history of how the roads were set up and utilized by the populace. This would no doubt be of great help to any RPG campaign set in the Edo period, but also to those just looking for information on the day to day life of the Edo period. Filling the book out is a random clan mon generator, a section that explains the Goshichido (the traditional regions of Japan), a modern prefecture to traditional province converter, a listing of other traditional regional names, and an extensive glossary of Japanese terms (many of which even we had never heard of). Want to know what a rensho was? How about a ryokoken or ryoshitsuji? They’re actually all the same thing-an associate regent for the Hojo Shikken that sealed the documents of the Bakufu. The answers to the mysteries of the Bunei No Eki, Udaiben, Kakitsu No Hen, Kumonjo, Fushibugyo, and Chinjufu Shogun can all be solved here as well. Since some of the book’s sources are older, occasionally the information is a bit outdated or conflicting. For example, Kira Yoshihisa (he of “47 Ronin” fame) is given the older rendering of Kira Yoshinaka. It’s mentioned that three of Minamoto Yoshtiomo’s sons were spared by the Taira in the aftermath of the Heiji Incident-actually, it was six. Minamoto Yoritomo on page 104 is claimed to have been in the custody of Minamoto Yoshitsune’s mother, Tokiwa Gozen, when he was spared (he had actually been captured by Taira forces while fleeing with his father eastward-this entry also implies he was Tokiwa’s son, but Yoritomo’s correct mother is given in his earlier biographical entry). As you can see, these types of outdated information tend to be very minor and not nearly as bad as what’s seen in a typical Stephen Turnbull book. 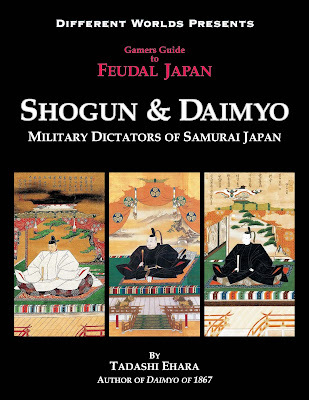 …as a whole, “Shogun and Daimyo” proves to be an invaluable source for both gamers and historians, particularly when paired with its earlier companion volume “Daimyo of 1867”. As a quick reference work for dates, clans, holdings, and historical figures, it will save much frustrating rooting around in multiple sources. We use “Daimyo of 1867” on a regular basis and it appears the new book will get an even heavier workload. It’s a winning book about the losers of the samurai class. You can pick up “Shogun & Daimyo” on Amazon through the SA Store HERE or directly from Different Worlds Publications. There’s also a special price on the Different Worlds site when picking up the new book along with the original Shogun & Daimyo.